Weddell seals, such as this female, are being studied by biologist Terrie Williams during an 8-week expedition to Antarctica. Eight years after her last major expedition to Antarctica, biologist Terrie Williams is back on the ice. This time, however, her team began the expedition during the Antarctic winter, the harshest season in the harshest environment on Earth. From a remote field site on the Antarctic sea ice, the researchers are posting notes, photos, and video on an expedition web site. 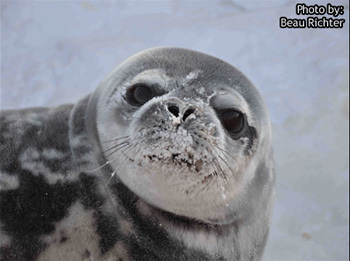 Their goal is to discover how Weddell seals survive the winter beneath the sea ice of McMurdo Sound. The Weddell seal is the only mammal, other than well-equipped humans such as Williams and her colleagues, to live in McMurdo Sound during the brutal winter months. "We have already gone through a 100-degree change in wind-chill temperatures, from minus 100 to 0 degrees Fahrenheit," said Williams, a professor of ecology and evolutionary biology, in an e-mail. In 2001, Williams studied the underwater world of Weddel seals during the Antarctic summer using video cameras worn by the seals during their dives beneath the ice. That expedition was also documented on a web site (see earlier story), and Williams described her adventures studying Weddell seals in a 2004 book, The Hunter's Breath. This year, thanks to technological improvements, the monitoring equipment is smaller and more sophisticated than ever, giving the team a new perspective on the lives of Weddell seals. The miniaturized instrument packs worn by the seals record what they see and hear underwater, monitor where they go, and even record the ocean temperatures and other environmental conditions they encounter. Williams said she is particularly interested in how the seals will respond to changes in their environment caused by global warming. "The seals are monitoring marked changes in the polar environment that will ultimately dictate their survival," she said. The researchers will be posting updates on the web site each week for eight weeks. The nine members of the expedition team include researchers from UCSC, Texas A&M University, and University of Texas. Their expedition is funded by the National Science Foundation, Division of Polar Programs.